Psalm 78:35 (ESV) "They remembered that God was their rock, the Most High God their redeemer." With all of our phones, apps and reminder notifications, it would seem that we really shouldn't forget things; unfortunately, we still do. Forgetting isn't a new struggle. Humans are forgetful. And undoubtedly, it'll always be an obstacle for us to overcome. Psalm 78 is most likely written by Asaph, a servant to King David. Two themes emerge from this text that are very applicable to our generation today: Keep telling God's story, and keep remembering God's story. As a parent, I have a responsibility (Deuteronomy 6:4-9) to teach and remind my children about Truth. I can't just tell them once and expect them to remember. Romans 10:17 tells us that faith comes from hearing. But the type of "hearing" referenced here isn't a, "I heard you," reaction. It's a place where hearing the faith experiences of others creates a stirring of our own faith. Revelation 12:11 says that our words and testimonies will help others overcome the spiritual battle we all find ourselves in the midst of. So, this can't be a one-and-done conversation; it's something that needs to happen again and again in all generations. A huge benefit of retelling is for future generations to believe, but retelling is also for our benefit as well. Psalm 78:12-72 reminds us to keep looking back on the struggles and victories of those who have gone before us. Asaph specifically references experiences — from Moses to David (Psalm 78:1-10) and to the Israelites wandering (Psalm 78:9-41) through the wilderness — for others to look back on and remember what they went through. One of the best lessons we can remember from this passage is found in Psalm 78:35: "They remembered that God was their rock, the Most High God their redeemer." There are times where my remembering and retelling is a very personal and private process. But, the more I study and then tell what God is teaching me through His Word, the more I personally remember and almost always, the more others benefit and remember as well. 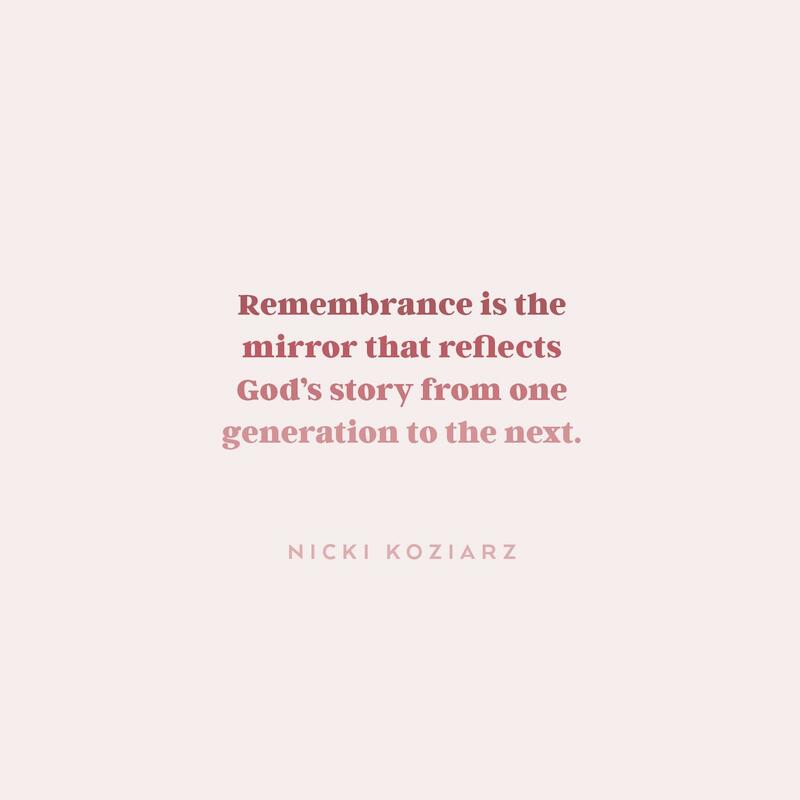 God's story is a continual process of private remembrance and a consistent public conversation. May we remember and retell. Prayer: God, help me to remember and tell the things You are teaching me through Your Word. In Jesus' name, Amen.